Product code: W1295 Categories: Sold Items, Sold Rolex Watches. There is something about a vintage Rolex on your wrist, whether it be the look, style or history or indeed a combination of all of these things and here is a great looking vintage Rolex Precision reference 9083 fitted in the so-called UFO case. Dating from 1957, this Rolex Precision has the riveted Rolex band fitting into the case so well, and the band itself is in such great condition with no flex as would be expected from a Rolex watch of this vintage. The case is referred to as the UFO case, as it was made in 1950’s when there was so much hype about little green men from outer space and this combined with its original honeycomb textured dial all come together to really sit and look so elegant on the wrist. Measuring 35mm across plus the Rolex crown, the dial is all original and achieved a wonderful patina that only age can do, making it look even more elegant and refined. Inside there is the brilliant 17 jewelled manual wind Rolex calibre 1210 which has an astonishing 58 hour power reserve and comes with our twelve month warranty. No matter when this watch is worn, it will always have the feel and look that only a vintage Rolex watch can have and will always be admired every time that it is worn. Tags: Rolex, Rolex 9083, Rolex UFO 9083, Rolex Watch. The Rolex watch company is one of, if not the most recognisable watch name today. Yet the Rolex company is young when compared to many others wrist and pocket watch makers such as Patek Philippe (founded in 1839), Omega (founded in 1848), Audemars Piguet (founded in 1875) and the very long history of Vacheron Constantin (founded in 1755). Rolex was originally started by Hans Wilsdorf and his brother-in-law Alfred Davis in 1905 under the name “Wilsdorf and Davis” in London where they would import Swiss movements and dials, and then put them in watch cases to retail to stores who would often put their own name on the dial. These original watch cases are sometimes stamped “W & D” and are the earliest forms of watch cases by them. It was also common for them to use cases made by the Dennison company during this period. 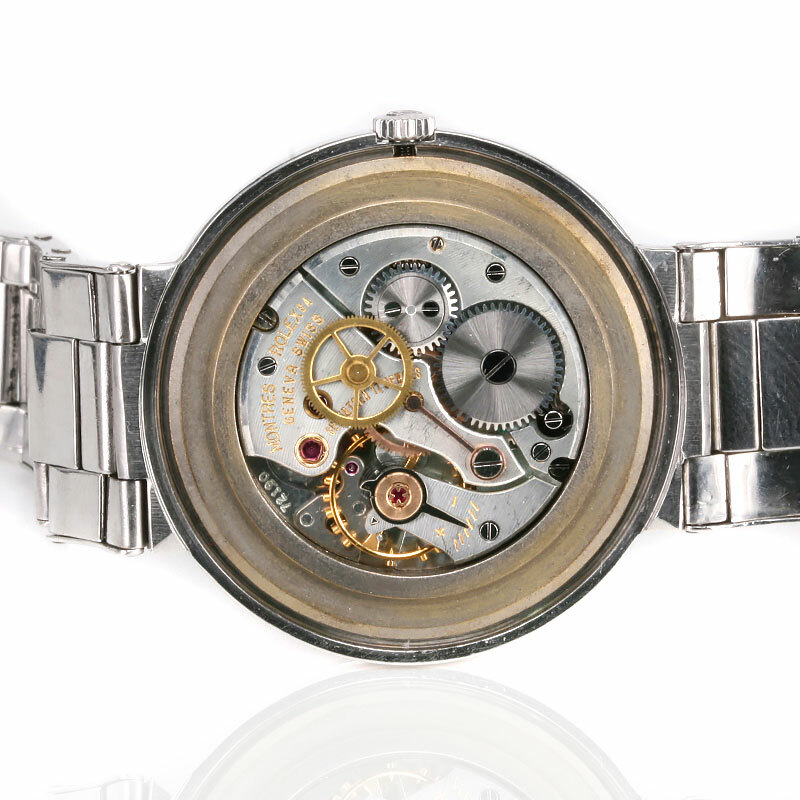 The main supplier of movements was from Hermann Aegler and together with Wilsdorf’s continual push for a movement small and comfortable enough to be worn on the wrist – still until this time, pocket watches were being produced, and many early wrist watches were just pocket watch movement and cases convert to be worn on the wrist, and a movement that was of a very high standard that could keep perfect accuracy – indeed in 1910 they sent their first movement to Switzerland and it was awarded the world’s first chronometer rating for a wrist watch.It didn’t take long for Hans Wilsdorf to realise the merit in joining up with Aegler and producing a high grade watch in Switzerland, so in 1919 moved the company over – firmly establishing the Rolex Watch Company. This name later changed to Montres Rolex, SA, and finally to Rolex, SA. Wilsdorf and Davis were not content in being just another watch company. In a very short 20 years, Rolex had achieved over 20 world records. These included the now infamous Rolex Oyster case , the world’s first true waterproof watch thanks to the screw back and screw lock crown – an innovation still in use today, the first true perpetually wound (automatic) watch, which became the now highly sought after “bubble back”. They also created the first water resistant watch to achieve the depth of 330ft, a specially made model that went to 11,000 ft, the Milgauss which was built to handle strong magnetic fields such as those found in scientific labs, power plants etc. Rolex have continued to strive for excellence, and there is so much more to the history of Rolex that this article just scratches the tip of what has become an enormous iceberg of a wonderful watch firm.